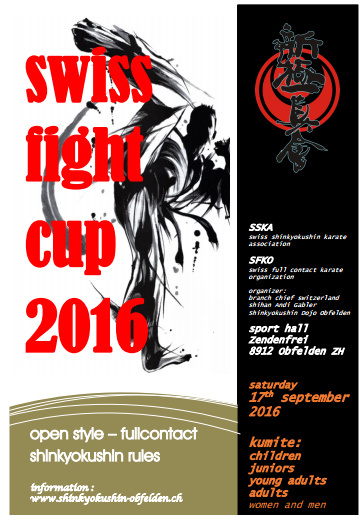 Dear Presidents, Country Representatives, WKO Branch Chiefs, National Coaches Dear Shihan, Sensei, Senpai, Dojo Leaders and Karatekas On behalf of swiss shinkyokushin karate association SSKA, we are very honoured and proud to invite you to Swiss Fight Cup 2016. The tournament offer categories for all ages, children, youth and adults. Organizer Shihan Andi Gabler, branch chief Switzerland.